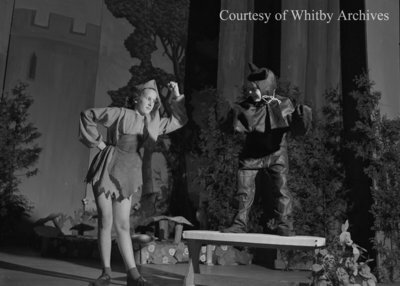 A black and white large format negative of two cast members from "A Cobbler in Fairyland" on stage. In this view a female is shaking her fist at a male standing on a bench. Junior Theatre, May 28, 1949, Marjorie Ruddy. Whitby Archives A2013_040_350.